A posting on Facebook by a friend (who sniffs out exotic information then shares it with the uninitiated) led to my discovery of the Nicholas Roerich Museum, a jewel box of a building on W. 107th Street that showcases this multi-faceted painter, writer, traveler, and spiritual visionary from the early 20th century. I decided to learn more about what sounds like a character from Doctor Zhivago, and on a blustery autumn day, visited this perfect oasis that promised an exotic tonic of Tibetan and Russian ingredients. What I discovered was one of those Russian nesting dolls. Just when you think that’s all, you find another layer. The museum is the reliquary for the impressive output of artwork as well as examples of the spiritual and intellectual beliefs of Nicholas Roerich. Born into the upper-middle class in St. Petersburg in 1874, he witnessed the devastation and upheaval of both World War I and the Russian Revolution. Concurrently, his new interests of Theosophy, Vedanta, and Buddhism began to take root. The early 20th century was an intoxicating time for Russian intellectuals and creative types, but in 1917 he became disenchanted with the new regime, and with his wife Helena emigrated to Finland, then westward to Paris, and in 1920 was sponsored by The Art Institute of Chicago to tour the United States. Along the way, they founded the Agni Yoga Society, designed for a New Era that embraced science and psychic energy. 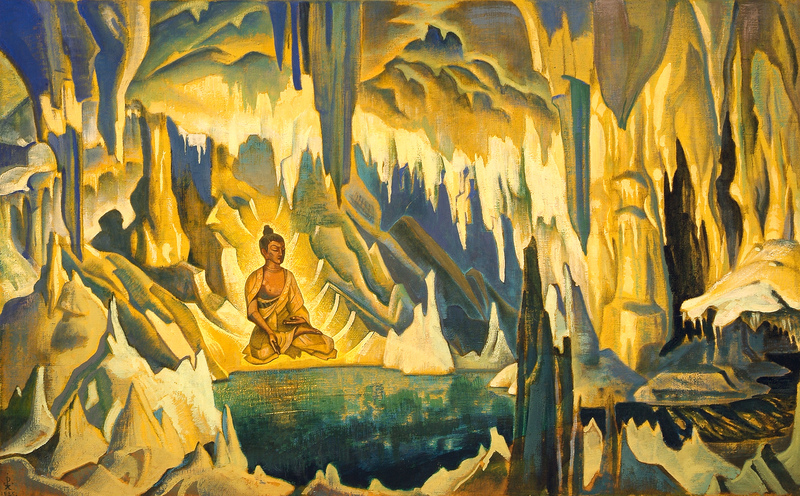 Roerich was developing quite a following, both artistically and philosophically. I climbed the stairwells of this handsome townhouse, greeted by Hindu goddess statues perched under luminous paintings of ice-covered peaks. The walls and floors on three floors are juxtaposed with nearly 200 paintings and the Tibetan sculptures and artifacts he collected on expeditions that took him throughout India, Kashmir, Tibet, and Manchuria. Besides painting, he was also promoting his passionate belief that all examples of cultural heritage, past and present, must be protected from the ravages of war and neglect. This became the Roerich Pact, a treaty which many countries, including the U.S., signed in 1935. The works on the wall, with their clarity and brilliance of mostly flat color, hint at the influence of an artistically heady time when the Paris salon scene was scandalously offering up Cezanne, Gauguin, and the Cubists. Subject matter arcs from Himalayan mountain ranges to decorative panels designed for ground-breaking ballet and operas by his contemporaries and creative collaborators, Diaghilev and Stravinsky. In addition are works that reflect what he was really pursuing: a moral compass by which to live peacefully in a tumultuous world. The Himalayans, fascination with eastern religions, and a growing interest in occult mysticism influenced the subject matter for many of his paintings. Roerich painted both western and eastern spiritual leaders, among them Krishna, Elijah the Prophet, St. Francis, the Tibetan legend King Gesar, Mohammed the Prophet, the Madonna, Chenrezi (Bodhisattva of Compassion), and St. Issa. The latter is featured in one of the more mesmerizing paintings, Issa and the Skull of the Giant, reflecting the concept and belief held by some that Jesus (St. Issa) traveled from Jerusalem to Tibet during his earlier unaccounted for years, and was thus influenced by Buddhism. A chat with museum director Daniel Entin revealed more layers. Why was Roerich sponsored by the government to traipse around Manchuria? (On the record? Collecting drought-resistant grasses after the Dust Bowl). And that secret detour into Moscow? An attempt to spread his “peace through culture” (Pax Cultura) message to former classmates, now heads of state. Amid all the intrigue, he was nominated for the Nobel Peace Prize three times. Things are changing. While Roerich has a large following of Russians, who consider the small museum almost a mecca, other groups, such as the Center for Peace through Culture, are waving the Banner of Peace he designed. Last but not least, if capitalism has any stake in the claim of this utopia he dreamed of, the painting Miracle of Madonna Laboris broke records in auction last year at £7.9 million–not exactly chump rubles. Which might prove that Nicholas Roerich can finally have his Russian tea cake and eat it too.